Mike Downs is building fences because he wants to, not because he has to. In an industry dominated by cheap, subcontracted (and often illegal and uninsured) labor, Mike’s been proudly doing his own work for years. While other fence contractors are building fences for the money, Mike’s building chain link, wood privacy, and wrought iron fences because of the joy it gives him to serve his community. What services does Mike Downs Fencing offer? This Sherman, Texas fencing company specializes in just that, fencing! Most of our customers are looking for wood privacy fencing but many also want wrought iron fencing or chain link fences. We also put in quite a few automatic gates. Less often, we install decks and arbors, usually just by special request from a customer who’d rather not take a risk on a different company. How long has Mike Downs Fencing been in business? This is a third generation fencing business. It began with Mike’s grandfather, Wayne Carr (under his name of course). But Mike Downs didn’t get into the fencing business right away. After high school, he joined the military as part of a proud family tradition of loving and serving America. His experiences in the military shaped and molded him, helping him grow into the man he is today. They also allowed him to take a stand to protect the freedom he so values in our country. After the military he went to college and majored in accounting. It was while he was studying that he re-started the retired family business under his own name. Fencing properties was a great way to earn money while going to school and it allowed him to work hard and build relationships with friends and neighbors. People loved his honesty and his work ethic and the business just grew and grew. Why does Mike Downs continue to work making wrought iron, wood privacy and chain link fences in Sherman Texas? Mike Downs builds fences because he loves building fences. He loves to serve his Sherman, Texas community, build relationships, provide a great service at a very fair price, and feel good about his work at the end of a long day. After getting a degree in accounting, Mike went on to work in public finance corporate accounting. It was work he excelled at but with his entrepreneurial spirit, Mike couldn’t find the same satisfaction working in the finance industry as he did working in his own community. It was the joy of serving his neighbors that pulled him away from finance and back to his own business. He still regularly gets calls from recruiters in the financial industry but he’s never looked back. Among Sherman, Texas fencing contractors you just won’t find anyone else quite like Mike Downs. He is the real deal; a genuine Texas man whose faith and family inspire everything he does. What should a customer look for in a good fencing company? What shortcuts do fencing companies take? In our Texas soil, good post depth is absolutely necessary for a strong, stable, lasting fence. Most fencing companies drill down 18-24 inches and put the fence posts there. But unlike other fencing contractors Mike Downs installs every fence post to a depth of 3 feet, no matter how tall or short the fence. He bought a specialty machine to do the work, because with Texas drought conditions the soil is cracked, loose, and expanded for the first two feet down. Mike knows it’s that third foot of soil that’s really solid and provides maximum strength to the fence. (He knows because he does the repairs on other fences!) Mike also makes his post holes wider than other companies and uses maximum strength concrete to lay his posts. The concrete Mike uses is twice as strong as what most other fencing contractors are using. Others often install with a weak mix of sand, rock and a little concrete. It’s cheap but it’s not durable. These installation practices are why our Mike Downs fences last for many years, really for as long as the wood, wrought iron or chain link will last. Our fences don’t fall down, or get shaky. We guarantee it with a lifetime warranty on the workmanship but we don’t have many customers who need repairs. Mike Downs builds the kind of fences he would want to live with; strong, sturdy, long-lasting and excellent. With Mike Downs fencing customers also get a lot of little freebies and extra services. Mike wants them to be comfortable and satisfied and he treats them the way he would want to be treated, helping them make the best decisions for their property and getting all the details just right. What do you look for in great gate construction? What about automatic gates? Professional. Reliable. Trusted. Since 2002. Gates are easy to construct, it’s the lifetime use of the gate you have to worry about. After an installation the ground settles out over time; this can cause the gate to become uneven and affect its swing and ability to close. 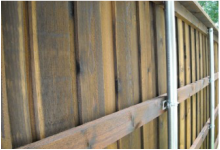 Of course wood also swells and retracts continually so this can also affect the mechanism of the gate causing it to no longer line up properly. It’s a very frustrating problem for customers. There’s no way to build gates without these issues so Mike just offers lifetime gate adjustment service to all of his customers. He stops by and adjusts their gates any time they ask, no matter how old their fence. This service keeps his customers very happy! Why do you not subcontract labor? Subcontracted labor is often a money-saving shortcut for those who don’t want to hire full time employees. Many laborers are illegal and uninsured. This puts the business and the customer at risk. Subcontracted laborers work for very little, they don’t have an incentive to do good work and they often aren’t supervised well. There is a tendency to cut corners, leave messes and not go the extra mile for the customer. With such strong business and installation practices, how do you keep your prices low? Mike Downs does almost all his own labor. He has little overhead because he does his own estimates, answers his own phone calls, interacts with his own customers and puts in his own fences and gates. You never have to wonder who will show up for your installation, it will always be the same man you met during your estimate, Mike Downs. His name is on the business, he does his own work, and he guarantees the quality will be high. He doesn’t have to waste time going back to fix mistakes or do repairs on his fences and gates. He does his work right the first time and that helps a lot with keeping costs down. He also doesn’t have to pay for marketing. His customers are his marketing plan. When Mike Downs installs a fence he has a customer for life, and that customer tells others about his quality fence. Most of Mike’s business is from referrals. Customers tell their friends and neighbors and the business continues to grow. In Sherman, Texas people run into each other all the time. Mike wants his customers to always be happy to see him. He knows good quality work turns customers into friends. What values have been built into the Mike Downs Fencing Company? Mike Down’s value for his good name shapes his entire business. The power of his grandfather’s name in the community was what first made the business successful. Everyone knew Wayne Carr as a good, kind, generous, and honest man, even his competitors! That’s why it was so easy for Mike to pick the fencing business back up in a community-oriented place like Texas. Mike named the company after himself because he too believes that a good name is more valuable than almost anything else. Today, Mike Downs continues to value his good name more than profit. He will take a loss rather than sully his name in the Sherman, Texas and surrounding communities. Service With a Smile Since 2002!